Over the winter Allsop Home & Garden sent me two packs of plants labels you can write and erase. 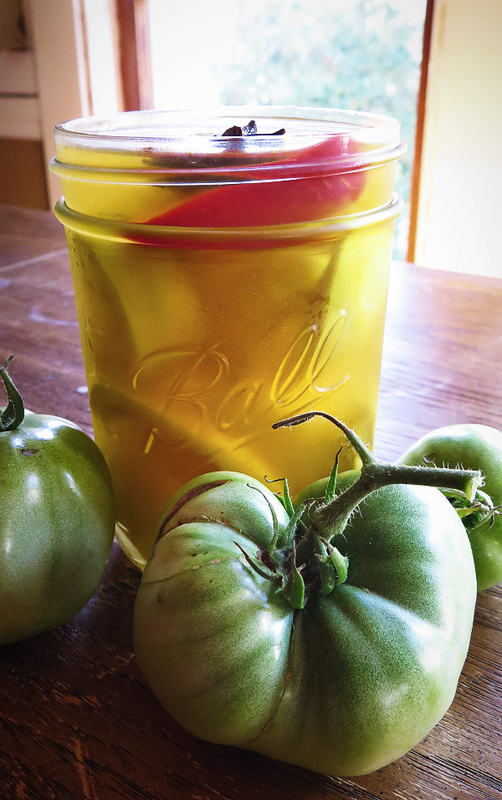 While you can make your own plant and seedling labels/markers out of recyclable materials, sometimes it is nice to have a polished garden item or two around. The plant labels themselves are a sturdy rubber material that is pre-printed with illustrated silhouettes of a number of herbs and ornamental garden plants. 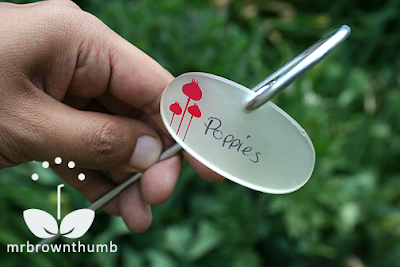 You can write the names of your plants or seedlings on the label, if the time comes when you need to change what you wrote you can rub it out with an eraser. The packs of plants labels also come with miniature shepherd hooks, which are also well-constructed. 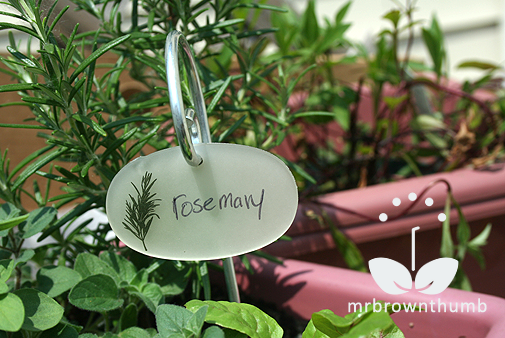 The rosemary plant growing in my container garden gets a plant marker all for itself. The plant labels, as you can see they come pre-printed with illustrations of some popular herbs, perennial and annual garden plants. The labels are suppose to be UV resistant and so far they haven't faded in the sun and the names I wrote on them haven't washed off either. The cool thing about these plant labels is that they're intended to be re-used in the garden season after season. Here is what they look like when you've added the rubber plant label to the mini-shepherd's hook. I was actually surprised by how sturdy the metal hook is. I was expecting them to be easy to bend and they're not. The hooks are great if you have kids or pets that are always trampling the plant tags in your garden. 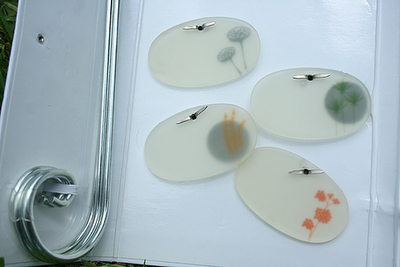 The re-usable plant tags come nicely packaged in sets of six. You can choose either the herb set or the ornamental plant set. While the plant tags are sturdy, beautiful additions to the garden, I have a couple of issues with them. The first seems kind of petty to me but I have to mention it. While I understand the size of the shepherd's hooks make packaging and shipping easy, I wish they were longer. After sinking a few of them in the garden's soil I realized I couldn't see the plants labels unless I got close to the ground. Their size is great for container gardens, but if you buy something as attractive as these labels for your garden, you should be able to show them off. You can write any plant name on them that you choose, but I'd like the illustrated silhouettes of the ornamental tags to match plants I actually have in my garden, and that's the only drawback I can see in buying pre-printed plant tags. I don't have any grasses or water lilies and whatever the other two pictured above are suppose to be. Which brings me to my final "issue" with these plant labels. It probably wouldn't hurt if the packaging for the herb/edible plant tag collection came labeled. These tags would probably appeal mostly to new gardeners who don't already make homemade plant tags, and I'm not going to lie; I had to really think to identify a couple of the leaf silhouettes. Everything about gardening should be easy to explain and understand for new and older gardeners, and that goes for plant labels. 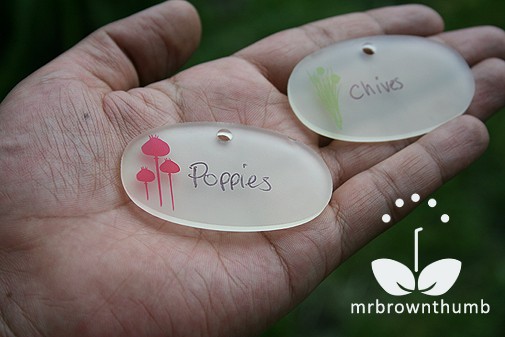 All in all, I think these plant labels you can write and erase to use again and pretty awesome. 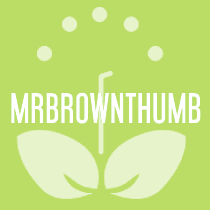 It would be nice if they created some plant tags like these for garden bulbs. They're sturdy and beautiful additions to your garden. If you're interested in purchasing them visit Allsop Home & Garden, who gave me these plant labels to try in my garden. While these plant labels are pretty and useful I've noticed that mine have turned yellow in the sun. Perhaps it is the nature of the clear plastic, but it is a bit unsightly. Allsop sent me some too, and I just haven't gotten them outside yet. I really think they're going to be fabulous, but we'll see what things look like next spring. (I plan to leave them outside to see what happens. I'll keep my aluminum markers. They're already erasable and reusable. They're available in varying heights. Most important, the surface area for writing is larger than these, and I can write on both front and back. These are very clean and pretty, Mr. BT! I may have to look into them in the future when I am employed again!!! LOL. For now, I am all into my thrift store finds and homemade from recycling stuff. I really like these tho!!! Nice review! I love how you review things and give your opinions!!! Very helpful! One of the prettier garden markers I've seen for sure. They remind me of ocean glass. I'm cheap and would rather make my own or would love to buy markers in bulk for me (I would want/need more than 6)BUT with that said - they'd certainly make a nice gift for a friend :) Thanks for posting. I'm curious about how the plant tags would hold up to a real winter. I'm thinking they're too "fancy" to leave out and experience a real winter. Keep me posted. Those are cool, but too expensive for me. Last year Target was selling copper ones in their dollar gardening section and I regret not buying every single one I came across. LOL. I think if I was rich I'd still make some of my own. They're just a fun gardening project to do. Thanks for commenting because you hit the nail on the head. They do look like ocean glass, don't they? Like you said, they'd make a nice garden gift for a friend. Wow these labels are pretty! I hope I can find these sort of lables here one day. Oh, would the silhouette be still visible (or less visible) if you turn the other side to the front? These are very sweet, Mr. BTh, however I use so many labels... ;-) How's your Spring going?? I went out to the garden today and realized one of the metal labels has been around for like four years. They sure are durable. HA! That's a brilliant idea. I'll be sure to use that for the ones that I don't have matching plants for in the garden. LOL, yeah making your own is a lot of fun. Yeah, they're better for small gardens or people who don't have A LOT of plants. Spring is going pretty good here. Hope yours is too. This can be a perfect gift foe my father this Father's Day! He loves gardening and it has been his hobby since he retired. I Love these plant markers and rosemary my favorite herb! love the look of these & I have been hanging onto several pairs of reading glasses that I bought at the dollar store & I bet I can get a similar look by sanding the lenses & drilling a hole in them. I love this idea & I can make some myself that are real close to these. I have been hanging onto reading glasses I got at the dollar store, that the earpiece broke off. I think I will sand the lenses & drill a hole in them & find some stiff wire (hey, I'm on a farm) & I think it can come out pretty close to this wonderful idea. Can you please tell me where I can buy these plant labels? Thank you!